Today I found out why pasta causes boiling water to froth. So why does it happen? It has everything to do with the composition of pasta. Pasta is made from flour, water, and sometimes egg—that means it’s basically just starch and protein rolled out into different shapes and dried. It’s the starch molecules that are important. Once they’re heated in a moist environment—like your pot of water—the starch will absorb more and more water until it finally bursts. That sends little starch molecules into your water, resulting in white foam. It’s the foam layer on top that causes the problems. What has happened is the starch makes the bubbles that were already there more stretchy and pliable, so it takes longer for them to burst. A lot of bubbles on the surface doesn’t allow for proper ventilation of steam, meaning the pot of boiling water becomes superheated if the pot isn’t stirred or the frothy layer skimmed off the top in time. The trapped steam causes the frothy bubbles to expand and pop up, resulting in boiling-hot pasta water all over your stove if you’re not careful. Don’t leave a lid on the pasta pot. This makes the starch molecules heat up very quickly. Leaving the top off allows steam and heat to escape more easily. Alternatively, for those who like to save energy by using a lid, simply turn the temperature of the burner down so that it’s just high enough to keep the water boiling. Leave a wooden spoon lying across the pot. This doesn’t work that well for massive foam swells, but for minor ones helps. Here’s how: when the foam bubbles up it will eventually meet the spoon. The foam is thermodynamically unstable, which means when the bubbles reach the spoon they will burst, breaking the layer of foam and sending the bubbles collapsing down again. Use a bigger pot. With higher walls to climb, the layer of foam likely won’t be able to bubble over the edges. There are also a few commonly touted tips that won’t actually keep your pasta from boiling over, or that shouldn’t be used to keep the pasta from boiling over. Add oil to the water. Okay, so this one does work by adding a different sort of surface tension to the water, meaning the bubbles will burst faster and you won’t encounter the problem of superheating. However, adding oil to the water has the negative effect of making all of your sauce slide off the pasta when it’s ready, so most cooks don’t recommend it. Does Alcohol Really “Cook Out” of Food? It’s also the starch that causes the pasta to stick together when you first start cooking it. If you’re not careful, it can meld together into one giant lump. As you probably know, you should stir it a bit at the beginning to make sure the pieces come apart. When you do that, the starch particles shake loose, allowing the pasta pieces to become individuals again. Of course, it also contributes to the problem of the starch building up on the surface. Adding a bit of pasta water to the sauce can actually help the sauce stick to the pasta. The build-up of starch, which gives the water its cloudy look, clings to both sauce and pasta, binding it together. There are actually “boil-over preventers” that have been invented and are being sold in stores. One type is a ceramic or glass disk that is placed at the bottom of the pot before any of the ingredients. It works by absorbing some of the heat to prevent the water from being super-heated while you’re cooking. A more technologically-advanced one involves a small device constantly blowing air over the surface of the water. While Italians are best known for their delicious pasta today, the Chinese are credited with eating pasta as early as 5000 B.C. That said, it wasn’t Marco Polo who introduced pasta to Italy as commonly stated; they likely had it as early as 400 B.C. Italian pasta wasn’t initially made with tomato sauce. Tomatoes are a “new world” food that Europeans hadn’t heard of until Cortez brought back a few crates of tomatoes from Mexico in 1519. It was another 200 years before spaghetti and tomato sauce became a more common dish in Italy. “Al Dente” is generally the preferred way to cook pasta. It means “to the tooth.” When biting into al dente pasta, it should provide some resistance to the tooth but still be tender. The average person in America eats about 15 pounds of pasta every year, while the average person in Italy eats a whopping 50 pounds of pasta every year. To feed all of these hungry pasta lovers, the US produces around 1.9 million tons of pasta every year, while Italy produces 2.75 million tons of pasta every year. In the mid-1700s, “macaroni” referred to a hairstyle and the person wearing it. It’s thought to have originated when English aristocrats returned from Italy with strange foreign hairstyles that didn’t go over well in the homeland. While making yourself a bowl of spaghetti is typically one of the cheaper meals you could cook, pasta used to be a luxury item in Italy because of the high labour costs. It became more accessible after the Industrial Revolution which meant it could be mechanically processed, drastically cutting down on production time. been cooking for 44 year never had so called boil over simply use a large pot like all italian do ……. 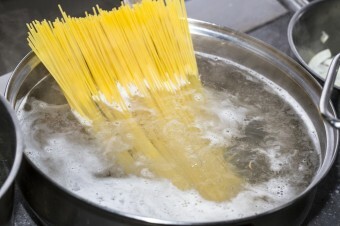 I put a few drops of oil, usually olive oil, in the water before boiling it and putting in the spaghetti. That prevents the spaghetti from sticking together. Well… that also helps the sauce to slide off right ? Using only a small amount of oil will work and your sauce will not “roll off”. No need to use oil, just boil your stuff in chicken stock like most restaurants do. Instead of tasting chicken it enhances the taste of your product really good. It also has the right fat amount to enhance the water tension while not lubricating your product. GOOD ONE. SUCH A HUMBLE TOPIC EXCELLENTLY TURNED INTO A SCIENTIFIC DISSERTATION. That’s hilarious! As I was reading the beginning of the foam and water dripping onto the stove, it just happened to me while i was making pasta! I put a wooden spoon on the pot when I am cooking pasta. This reduces the chance of it boiling over. It does work. Been cooking pasta for 40 years. I always would lower the heat. I’ve used the same pot and same pasta at 3 different homes…The only time i’ve had a problem with frothing is where I am now.. And the only difference is that now I’m on well water.. The water tests fine.. City water did not froth..